Today, woke up in a fuge state of uninhibited cuntery and felt compelled visit a coffeeshop, as this is the closest to my home - that's what I went with. Looked at their hazes and hashes. Left with 1.5g of SSH and 1g of 24K hash. About to give 'em a go in the vapcap and will report back and edit this post. Oily dark-brown exterior, fudgy consistency that needed to be bagged in a strip of parchment-paper. Smell is smooth and creamy, with a subtle peppery back note. Taste is less creamy and more spicey in the vapcap, potency is up there. Seems decent enough for the price, but it doesn't hold a candle to the age old (notorious) "Dam Good Hash" I still have from well over a year ago (that's how often or rather infrequently I smoke hash). Overall good enough for the price from a CS, worth checking out. A favorite go-to staple for our very own OHMF and Kenshiro-san. Smell was that of a proper fresh haze pungent candied lemons. Taste mostly follows nose, with an added dimension of a perfumed, creamy, soapy note and a bit more peppery as well though on the back end of the exhale. A solid enough haze for the price. Will update these brief reviews as I vape through more, hopefully. Still hoping that their "Top Tidghine" hash gets back on their menu one time liked that a lot. anyone tried it? maybe it taste like heaven? New menu for Siberie dated December 2, 2018. Thanks to mjb. Candy Cookie hash (12€/g) - This hash was sold in glas jars as kind of special... they have 1 gram and 2 gram (24€/g) jars of it on the menu. It´s a darker creamy hash not too sticky. It has a pretty complex smell which is not easy to describe for me a bit sour and a bit like essential oil (a mate from me reminded it also a bit of charras). That hash is also very tasty ... I heard from different sources in the last time that this year would be a excellent year for hash from morocco and all "new" hashes I tried this trip were really great! Very very tasty and pretty strong, too. 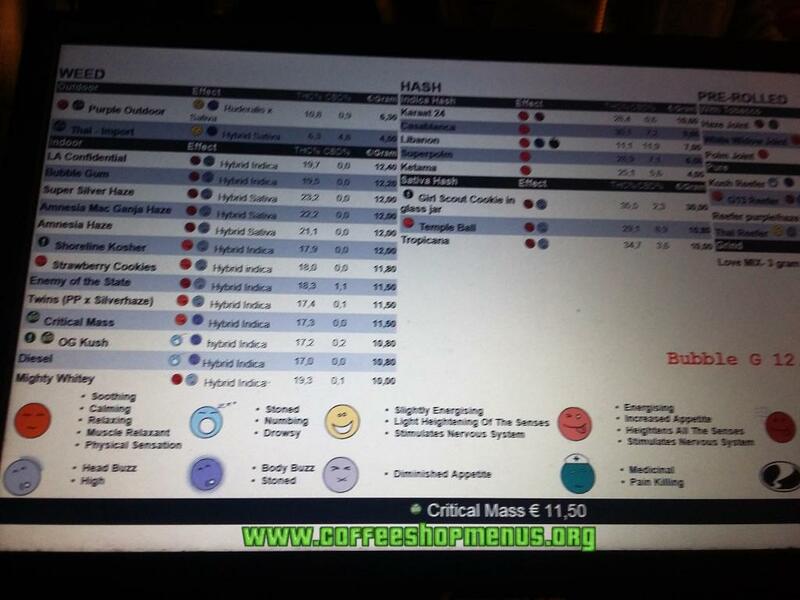 According to Siberie the Candy Cookie hash was tested with 52,7% THC and 5,8% CBD. Well like I said before I don´t really trust these tests from coffeeshops but it is strong well the effect is a good combination of high/stoned for me... it didn´t knock you out but it gives kind of nice strong head high with relaxing indica effects, too.. There is a lot of Candy Cookie hash around town atm... I saw it at Betty Boop, Easy Times, Solo... I tried now Solo and Siberies version and both were really nice! I am pretty impressed by all new hashes I tried this trip . Tangie Static from Solo, OG Kush and Candy Cookies from Siberie were really nice and a step forward in terms of quality. There have Top Tidghine on the menu did post a shot on IG. I a bit harder but get softer in the hands. @Marok21 That`s a shame higher price. Really hoping the kashmir comes back the last batch was really great. Here we really liking the candy cookies Is so nice to vaporize. And the Top Tidghine like above is say so a classic taste smell and feeling.